Welcome to Crown Custom Imports, your North American supplier of Spekva products, the world's leading manufacturer of solid wooden worktops. For generations Spekva has produced the finest quality wooden worktops for use in the homes of the most discerning customers throughout Europe. Find out why clients that demand quality demand Spekva. 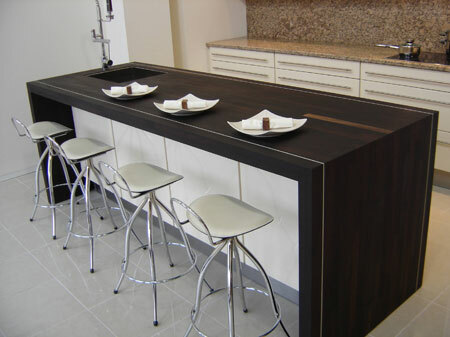 Visit our gallery to view some of Spekva's custom worktops and furniture pieces or download our brochure. Spekva offers a wide variety of products with flexible production for the kitchen and bath. If you can dream it, we can build it. Please contact us for more information to become a dealer or to locate a Spekva professional near you. Prime selected timber with color sorting. Diverse construction, the staves are randomly joined. Prime selected timber with color and quality sorting. Handpicked, the staves are regularly joined to create a symmetrical or brick-like pattern. 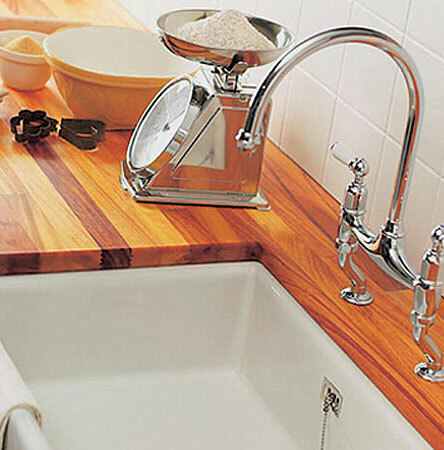 Prime selected timber with quality and color sorting with continuous staves that run the full length of the worktop. Note: Only certain woods types come in Royal styling. The endgrain style consists of staves glued vertically so that the endgrain or the growth rings of the wood are visible on the surface. Thickness ranges from 1 9/16 to 5 7/8 in. Very little—however, when you first receive the top it takes a few weeks to become saturated. Oil the top once a week for the first month, then once a quarter or when needed. Sprinkle a couple of drops of water on the surface of the top, once the water beads it has become saturated. From there on out your top may be required to be oiled two to four times a year. The oiling process is simple and takes less than 15 minutes to complete. Q. Will my wood top change color over time? Yes, All oiled woods will change color and darken over time. Some woods are more drastic than others. Iroko is the most drastic and does the majority of it's darkening in the first 6-12 months. 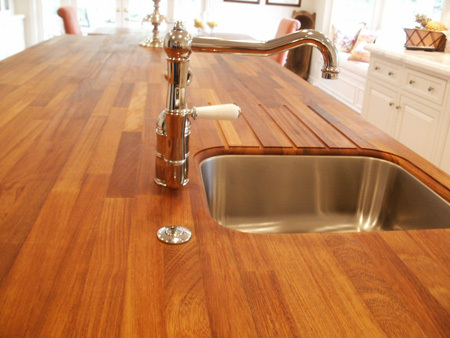 To allow for your wood top to develop an even patina, do not leave objects in the same spot for long periods of time. By obscuring the natural light, it will create a light spot where the object was positioned. If this does occur you can move or remove the object and the surface will be exposed to light and will darken naturally and eventually match the surrounding patina. Q. Which surface treatment has the highest durability and is most wear resistant? The oiled surface~ An oiled surface will have the highest durability, as it can be polished and thereby look brand new many years after it has been put to use. Q. Can I use my top as a cutting surface? 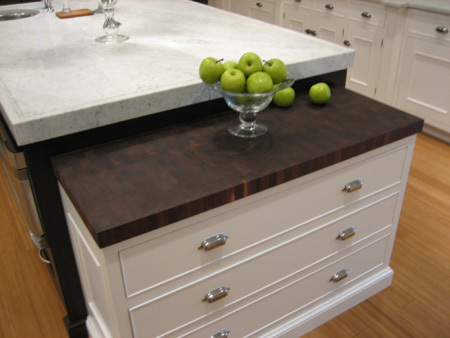 You should treat your top the same way you treat other solid surfaces. 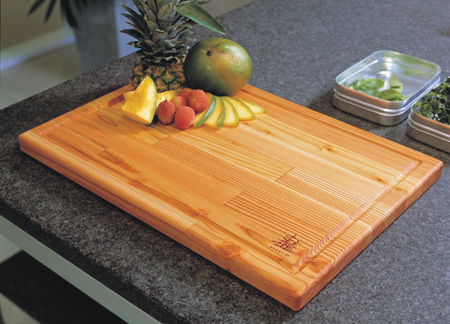 We recommend using a matching cutting board or designate a specific area for an endgrain chopping block. Spekva puts a 5 year manufacturers warranty on all products. Q. Should I be concerned about Salmonella? No more than you would be with any other countertop surface. A study published in May of 1996 by the University of Wisconsin found that wood yielded fewer bacteria than plastic after contamination. As opposed to artificial materials where bacteria are free to reproduce, solid wood contains enzymes that decompose and fight unwanted bacteria. Q. Are sinks a problem? No. With proper installation and maintenance water should never pose a problem. Q. If my top gets damaged can I repair it? Yes, you can repair it to its original beauty unlike other solid surface material. Depending on your repair you can remove an individual stave and replace it, or you can sand the entire top or just a specific area and then reapply additional oil. Q. How does wood compare in price to granite? It is difficult to compare. 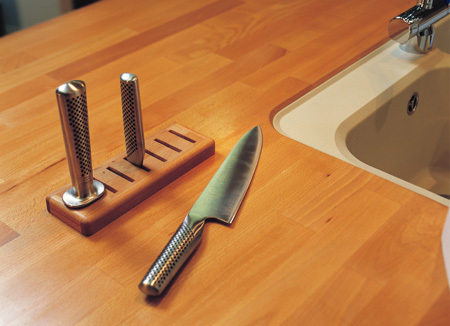 While both products are considered high-end, In comparing the two materials one must consider that the wood tops are made uniquely for the client with customized finishes and various stave pattern options. 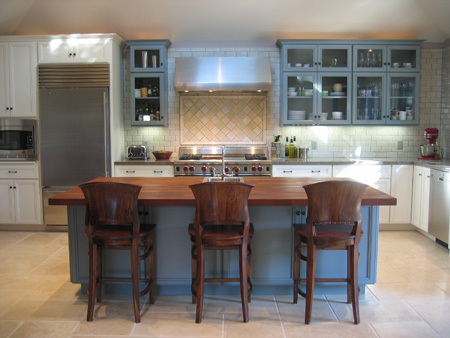 Granite is primarily a commodity product that is fabricated from slab form and can be easily priced by the square foot. Q. How do I incorporate wood into my design? With consideration to your work surfaces remember that you want to accomplish a look that is both aesthetically pleasing and practical. 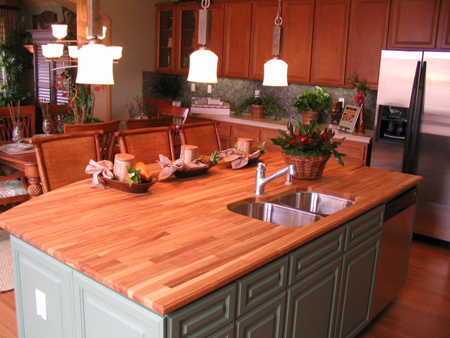 Whether considering an island worktop, a sink run, or an entire deck surface, your wood top can serve as a focal point in your overall design. In general good design is the ability to combine a mixture of materials to add interest while at the same time not compromising function. Allow enough contrast between your materials so that your individual elements have their own identity. Q. Will I have gaps between my countertop and my wall? Yes. 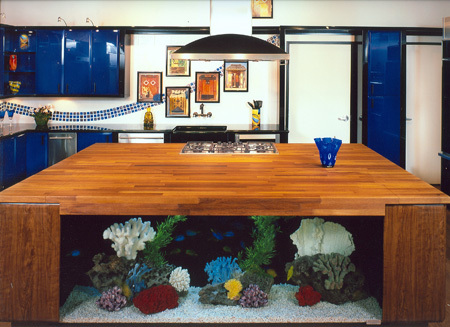 As with stone, concrete, and stainless steel it is difficult to scribe your solid wooden worktop perfectly to your wall. Also, with wood we must consider that it is a living product that will expand and contract slightly with temperature and moisture changes. When sizing your tops you should allow 3-5mm of room to allow for movement. If striving to achieve a clean look, be sure to check the walls to be plumb and level, then use silicone at the seam that can expand and contract with your wood. 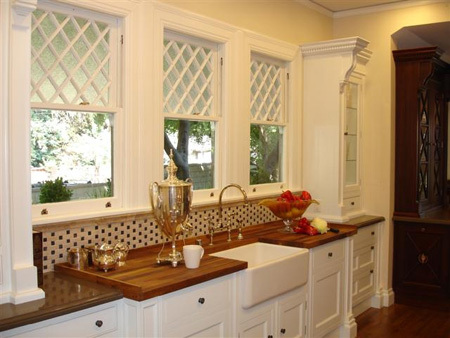 In some cases it may be best to consider a separate backsplash to conceal irregularities in the wall. Backsplashes of any material can rest directly on to your top providing that you use a silicone product at the seam for flexibility. Q. How long will my top last? With proper maintenance it will last a life-time and become even more beautiful. 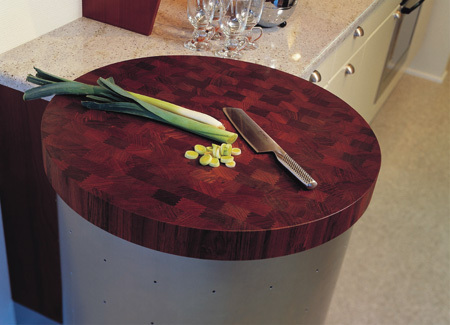 Learn more about Spekva's solid wooden worktops. Wood is one of nature’s finest and most solid materials emitting life and individuality. No two pieces of wood are identical and its beauty has been unsurpassed by any synthetic substance. 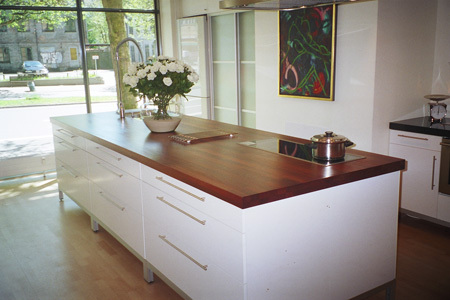 Since 1965, Spekva has manufactured the finest quality wooden worktops for use in the homes of the most discerning customers throughout the world.